Instructions: Cut a piece of cream cardstock at 8 1/2 x 5 1/2" and score this at 1/2 and 3/4 inch, fold the score lines. Cut another piece of cream cardstock to 7 1/2 x 5 1/2" and glue this on the 1/2" flap from the other part. Cut a piece of green designer paper from the collection at 5 1/4 x 7 1/4". Ink the edges with Vintage Photo and glue this on the front of the card. Cut a piece of light cream designer paper from the collection at 7 1/8 x 5 1/8". Ink the edges and glue this on top of the green one, take the black fine liner and make small stich lines around the edge. Cut the Ice skates here with your Silhouette machine and assemble. Color the bottom part of the skate brown and the steel part silver using markers. Make holes in the skate for the laces and get the rope through those holes, then get the fine liner and make little stitches on the shoe. Ink the edges of the shoe with Vintage Photo. Adhere using 3D foam pads. Stamp the Silent Night Scroll stamp on White cardstock using Tuxedo Black ink and die cut with the coordinating die. Color the holly with the blender and Bamboo Leaves ink, and the flame with Peanut Brittle ink. Ink the background and edges with Vintage Photo ink, and adhere this on top of the skates, then curl the edges of the scroll a little bit. Stamp two Pinecones, the Merry Christmas sentiment with the bow on white cardstock using Tuxedo Black ink, die cut with coordinating die. 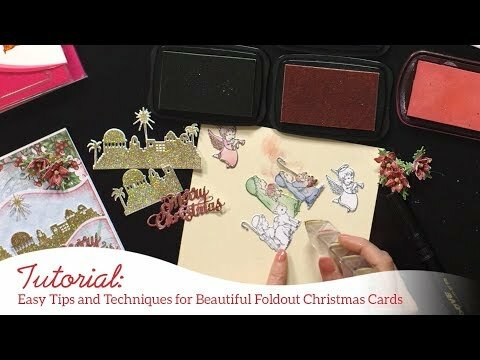 Stamp the holly using Bamboo Leaves ink, and the other Merry Christmas sentiment with Vintage Photo ink and die cut images with coordinating dies. Color the bow with Lady Bug ink and the pine cones with Rich Cocoa and Bamboo Leaves, the holly with Bamboo Leaves ink. Take the Nuvo drops Red Berry and apply dots on the berries, allow to dry. Stamp Blazing Poppy and 4 poinsettias on white cardstock using black ink and die cut. Color the centers of poppies very lightly using the daubers with Peanut Brittle ink, then color the edges with the Lady Bug ink. Color poinsettias with Lady Bug ink. Shape the poppies with the Basic Shaping mold and the poinsettias with the coordinating mold. 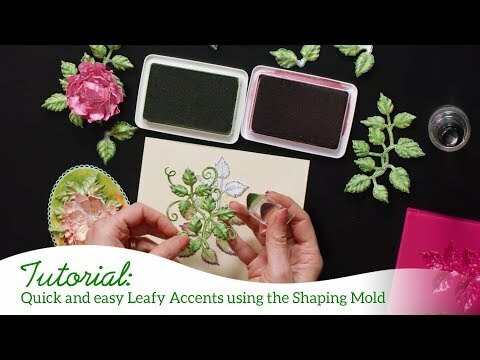 You can see Emma Lou's video above for more instructions about using the mold. Pierce the center of flowers and insert stamens. Assemble pieces as shown. Finally add Krystallos shard glass onto poinsettias and Frosting Powder onto poppy and on the rest of card as shown.